The more I study Genesis, the more I am convinced that we often come to the Creation story (and other biblical texts) with the wrong questions. How one answers the question, “Are the seven days of Creation literal?”, can determine in some people’s minds whether a person is orthodox or not. To some it is a question of believing or not believing in the authority of the Bible. Perhaps “wrong” is too strong a word in my above statement. Given our 21st century mindset, and the Creation-Science debate, the question of whether Creation took place in seven days seems to be perfectly logical. My point is that we often fail to examine the presuppositions that lie behind some of the questions we ask. If we fail to examine the presuppositions behind our questions, we are in danger of bringing our own agenda to the biblical text and expecting answers that the text may not be addressing. In other words, since the age of Enlightenment we are predisposed to ask questions about the material origins of things. Where did this come from and how did it happen? These are perfectly good questions but we mustn’t assume that they are the same questions people in the ancient world would ask. I am of the mindset that we should first seek to understand what the Bible means in its ancient context. I have written elsewhere on the importance of biblical backgrounds and understanding the culture of the ancient world (see here. You can also click on “Bible backgrounds” for other articles). Just as most people need the ancient Hebrew translated into a modern language they can understand, so it is important to translate (as much as is possible based on our current state of knowledge) an understanding of ancient Near Eastern culture (the culture in which the Bible was birthed). Once we can determine the ancient context and what a story would have meant to the original audience, it becomes an easier task to see what it is saying to us today. After all, if we come with our own agenda and seek to place an artificial grid over the text through which it must be interpreted, we can make the Bible say anything we like. My purpose in this article is to first examine what Genesis 1 meant in its ancient Israelite (Near Eastern) context, and then to return to the question of whether Genesis is teaching that Creation took place in a literal 7-day period. 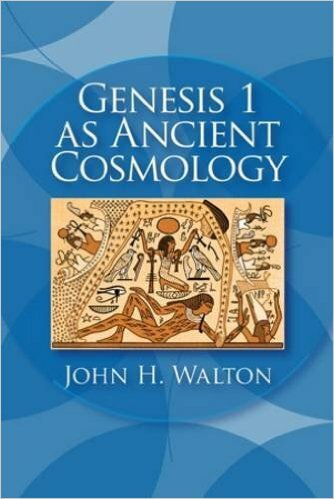 Walton’s book explores the connection between Creation and the Cosmos with Temples and their importance. His book is available at Amazon USA / UK and Logos/Faithlife. Ancient Mesopotamian, Canaanite, and Egyptian literature all share the common trait of viewing the temples of their various gods as being the hub of the cosmos (the world as they knew it). John Walton states, “Throughout the ancient world, the temple was a significant part of the cosmic landscape. It was considered to be at the center of the cosmos, the place from which the cosmos was controlled, and a small model of the cosmos—a microcosm” (Walton, J. H. (2011). Genesis 1 as Ancient Cosmology (p. 100). Winona Lake, IN: Eisenbrauns). The building of ancient temples are described in cosmic terms with their tops in the heavens and their roots in the world below (the netherworld). Temples were viewed as the foundation of the cosmos and the bond that held everything together. Temples were pictured as sources of life-giving water and thus were providers of the fertility of the land. From the temple the god controlled the fertility of the land. Most importantly for our purposes here Walton notes that, “The interrelationship between cosmos and temple is also evidenced by the fact that accounts of origins often include accounts of temple building, with temple building at times being at the climax of the origin account or even serving as the purpose for creation” (Walton, J. H., Genesis 1 as Ancient Cosmology p. 107). Walton not only makes these observations, but gives plenty of evidence by quoting from ancient sources. Check out his book if you’re interested in reading the actual sources. Another way of summing up the importance of the connection between creation and temple building is the quote cited by Walton from Coote and Ord which states, “The temple is the focal point of creation in nearly every account available to us“(p. 107, emphasis mine). Stories about Creation have connections with stories about building temples. This not only includes pagan temples, but the tabernacle and the temple of Solomon as well. Two other features are significant regarding the temples in the ancient world. First a temple is the resting place of the god. Although rest can imply different things since ancient gods had many human qualities, most importantly rest communicates the concept of rule. As when a god rests on his throne in the temple. This is not for the purpose of taking a nap, but for ruling. The other significant feature is that several accounts of ancient temple building relate it to a seven day inauguration period at the end of which the god comes to dwell in the temple. To this point we have noted connections between Creation and temple building and the concepts of rest (meaning rule) and seven days. However, all of this has been in reference to literature of the ancient Near East. The evidence referred to is not to say that the Bible has borrowed from the Creation myths or temple building stories of the nations around them, as much as it is to note that these things are part of the culture of the times. These ideas are in the “atmosphere” of the ancient world and as such Israel partakes of similar ideas (though distinct in other ways). This is where some, especially those who think of themselves as Bible fundamentalists, become uncomfortable. Before moving to the biblical evidence (which will hopefully satisfy those who are skeptical), I think it’s important to take a short rabbit trail and talk about the importance of understanding another culture. Although people today have different beliefs about various things, they share certain cultural language and understandings. If I say I have taken a flight from Paris to Atlanta, everyone knows that I booked a flight on an airline and flew in a plane to Atlanta. I don’t have to explain myself in detail. I don’t have to mention that I had to go through a security check. Everyone knows that is part of the procedure. If I talk about my laptop or texting someone, or say I have taken a “selfie,” everyone knows what I mean without further explanation. However, if someone from the past could come and visit our 21st century culture (even from as short a time as 150 years ago), they would have no idea what I meant by any of these things. Our culture, our history, our language, would all need explaining. If I told someone from the past that I flew from Paris to Atlanta they might think I’m lying or claiming to be a god (because who can fly? ), and they may not have any idea what Paris and Atlanta are. The same is true of the ancient world as we try and understand their culture and language. There are many concepts taken for granted because they were understood and didn’t need further explanation. Ancients understood the connection between Creation accounts and building temples. It was as much a part of their culture as selfies and laptops are a part of ours…no additional explanations were needed. This is why when we read Genesis 1:1-2:3 we do not automatically see that the Creation story is talking about God taking up residence in His temple. And if we preoccupy ourselves with questions from our own cultural standpoint (Are the seven days of Creation literal? ), we will never hear the original message. We need “ears to hear” and it begins with understanding the culture and the signals that are in the language of the text that communicates its meaning. The Ain Dara temple in Syria has many features similar to Solomon’s temple. Before presenting the biblical side of this argument I’d like to illustrate what I have just stated above. God authorized Moses to build a tabernacle, a dwelling place that would symbolize His presence with His people (Exod. 25-27). We are told that the plans were given to Moses on the mount and he was to see that everything was made according to that pattern (Exod. 25:40; Heb. 8:5). Therefore the plan of the tabernacle came from God. 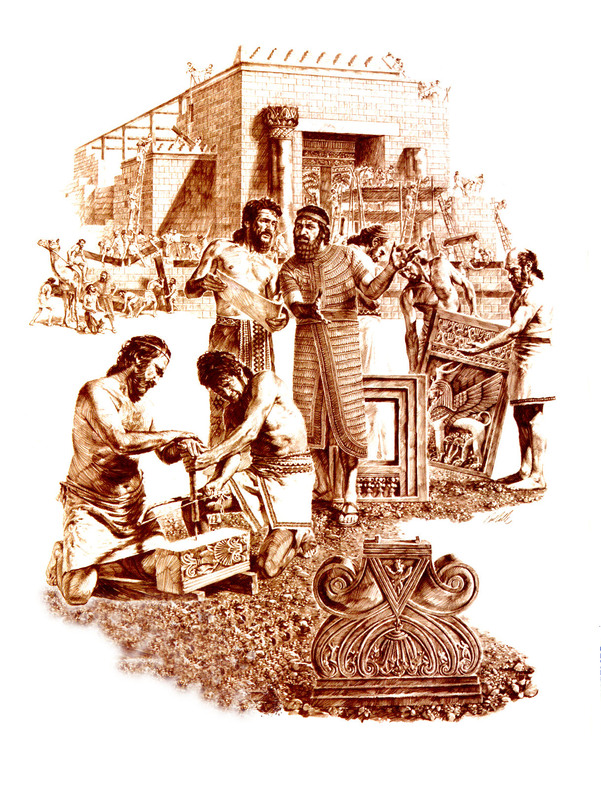 When Solomon’s temple was constructed, it was built by following the plan of the tabernacle, except that it was twice as large. However, we know from Scripture that Solomon was aided by Hiram, King of Phoenecia, and his craftsmen (1 Kgs. 5:18; 1 Chron. 2:7). 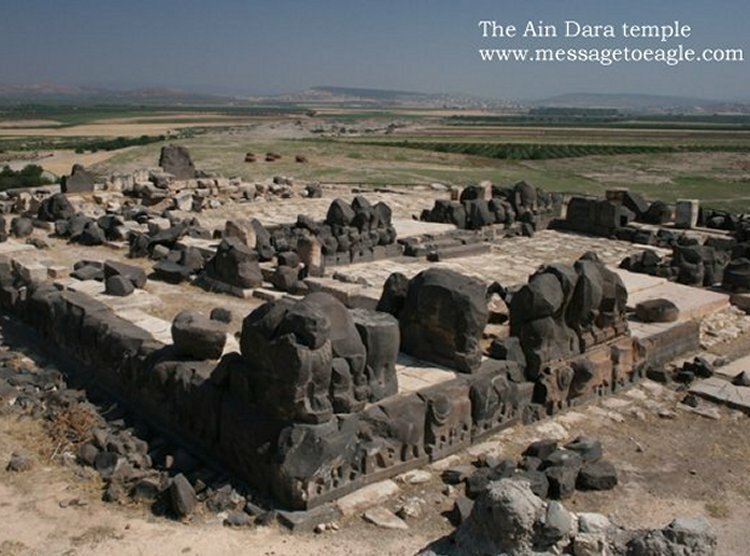 We also have evidence of temples built before the time of Solomon that resemble the plan of Solomon’s temple (see the picture at the left from Ain Dara). An article from Bible History Daily entitled “Searching for the Temple of King Solomon,” states, “the closest known parallel to the Temple of King Solomon is the ’Ain Dara temple in northern Syria. Nearly every aspect of the ’Ain Dara temple—its age, its size, its plan, its decoration—parallels the vivid description of the Temple of King Solomon in the Bible. In fact, Monson identified more than 30 architectural and decorative elements shared by the ’Ain Dara structure and the Jerusalem Temple described by the Biblical writers.” My point is that in some important ways, the Temple of Solomon was unique. However, in many other ways it resembled other temples that were part of the cultural heritage of the ancient Near East. Similarly, the Creation story in Genesis 1:1-2:3 is unique (and it certainly proclaims a very unique theology), however, it also shares commonalities with the culture of its time in the way the story is told. Although this is a humorous picture, it is an excellent illustration of how modern ideas can confuse the biblical message. God’s rest does not indicate He was tired, but that He began to rule! Although I admittedly went on a bit of a rabbit trail above, I hope I have demonstrated that it is important to consider evidence presented to us from the ancient Near East when seeking to understand the culture in which the Bible was written. What I would now like to demonstrate is that the Bible makes the same equation between Creation, temple building, seven days and rest. Isaiah 66:1 connects several of these ideas. In this verse, Heaven is said to be God’s throne, while the earth is His footstool. The next question concerns building God a temple: “Where is the house that you will build for Me?” In other words, if the heavens and the earth are God’s temple, how can He be contained in a building? The final question in this verse connects the idea of rest with a temple when God asks: “And where is the place of My rest?” The image of throne mentioned earlier in this verse helps us to understand that God’s rest involves his rule over Creation (the heavens and the earth). Psalm 132:7-8 speaks about God’s tabernacle, which is referred to as His “footstool” (just as the earth was called God’s footstool in Isa. 66:1). The psalm goes on to picture the ark of the covenant being taken up to be put in the tabernacle with the words, “Arise O Lord, to Your resting place.” Later in the psalm we learn that “The Lord has chosen Zion.” Zion is His dwelling place and God declares, “This is my resting place forever” (Ps. 132:13-14). These passages from Isaiah and Psalms clearly connect the ideas of God’s temple being His creation (heaven and earth), along with the tabernacle and temple which are only copies of the reality. These passages also assert that God rules from his Temple (that’s where His throne is) and it is His resting place. We have still not mentioned how the idea of seven days fits in. Above, we noted that in other ancient Near Eastern accounts of temple building the time period of 7 days was significant for the inauguration of the temple and its occupation by deity. The same understanding can be found in the account of the building and consecrating of Solomon’s Temple in 1 Kings 6-8. In 1 Kings 6:38 were are told that it took Solomon seven years to build the Temple. In chapter 8, the Temple is inaugurated during the Feast of Booths which occurs in the seventh month. This feast, according to Deuteronomy 16:13-15 lasts seven days. Solomon actually extends the seven day feast for an additional seven days (1 Kgs. 8:65). Note the emphasis on temple building and the number seven in this passage: 7 years, the 7th month, a 7 day feast, followed by another 7 days. 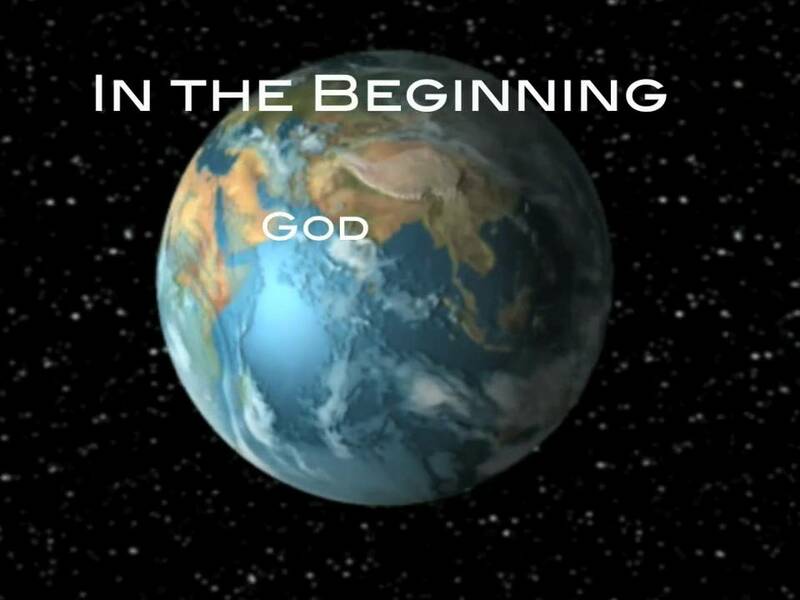 When Genesis 1:1-2:3 relates that God created the world in seven days and then rested, what it is seeking to communicate is that God created the earth as His Temple. God’s desire is to dwell with human beings. That’s what a temple or tabernacle is all about. God’s rest on the seventh day means that He has taken up the task of ruling over what He has created. This truth is communicated very effectively by John Walton and N.T. Wright in a couple of short videos. Here are the links: John Walton: Interpreting the Creation Story; and NT Wright and Peter Enns: What Do You Mean By Literal? Conclusion: So Are the Seven Days of Creation Literal? After looking at the above argument and watching the video by NT Wright and Peter Enns, my hope is that we might rethink our question. My question would be, “Why does the inspired author structure the Creation story according to seven days?” One answer could be, “Because it really happened in seven days.” But based on the evidence presented here, we might say that a more important observation is what those seven days communicate. If the Creation story is seeking to tell us something about God’s desire to dwell and rule among his creation, that seems like a far more important truth than simply saying seven days means He created the world in seven days. The modern question and answer doesn’t leave us much to chew on. But the intent of the story in its original context gives us a lot to think about! The debate about whether the days of Creation in Genesis 1 are 24 hour days has good arguments both for and against. For example, the sun, moon, and stars are not created until Day 4 (Gen. 1:14-19). Since we are told they were created “for signs and seasons, and for days and years,” we might conclude that it is impossible to tell how long the first three days were. We measure days, months, and years by the sun and moon, so how do we know that days 1-3 were literal 24 hour days if there was no sun or moon? Another unusual feature of the Creation story is that every day ends with the statement, “And there was evening and there was morning.” Every day, that is, except day 7 which has no ending whatsoever. Now that’s a long day! This clearly suggests that the focus is not on a 24 hour period. However, the 24-hour-side might come back and point out that Israel is commanded to keep the Sabbath because, “In six days the Lord made the heavens and the earth…and rested on the seventh” (Exod. 20:11). This now sounds like literal 24 hour days. More arguments can be mounted in favor of both positions. To me the sad point in all of this is while we argue which position is the correct one, or the most orthodox one, we are missing the true beauty of the Creation narrative and the real significance behind the meaning of the seven days! In the end, it doesn’t really matter to me whether God created the world in 7 literal 24 hour days or in a longer (or even shorter!) span of time. I want to know why He created this world, and what Genesis 1:1-2:3 has to say to my life. Great post, as always! Thanks for the effort and research that goes in to these. I wish everyone could tune in to this perspective about the biblical creation accounts and stop creating false and divisive orthodoxies! Your last two sentences are a wonderful summary of the whole thing and I wish we all shared the same sentiments as believers! Thanks for the encouraging words Ben. Thanks for this, Randy. This is great. Ever since reading Michael Morales’ book “Who Shall Ascend the Mountain of the Lord?,” I’ve been wanting to write up a post on the seven days of creation. Morales highlights how the creation was meant to bring people into fellowship with God. The tabernacle had the same purpose, it was set up like creation, and the dates of the calendar (like the lights of Gen. 1.14b) told Israel when they could have festal fellowship with Yahweh. Hi Spencer, that’s a book I’ve been wanting to read. Hope all is well with you guys and that school is off to a good start. God bless! Ancient Near Easterners seem perfectly capable of believing that a powerful creator deity like Marduk or Yahweh could create the world in seven literal days, or even in one day. They also seem perfectly capable of believing that “creating” consisted of dividing things in two, like separating heaven from earth, and that words spoken by gods had magical powers, etc. Moreover, the creation stories back then centered round the creation of the earth and things on it, above it and below it, as if the rest of the cosmos, the sun, moon, stars, etc. were mere ornaments created for earth and its inhabitants (the sun, moon, and stars being created so that humans could keep time between religious festivals). So they were perfectly capable of believing that the earth was the literal foundation of creation with heaven above and the land of the dead below. A storied cosmos. In six days the Lord made heaven and earth, and on the seventh day he rested, and was refreshed. It seems to me that the work of setting everything up in the beginning involves far greater rule and obedience to divine commands than the work of managing things afterwards, with people already set up to do your gardening (Genesis) or to sacrifice animals and plants to you (Cain and Abel), so you can “smell the soothing aroma.” Doesn’t sound like as much effort is being expended as at the creation. Walton sounds like he is waffling here. (Maybe he should take time to fetch his breath?) Walton also admitted that he disagreed with Prof. Mark on the question of what “rest” means in Genesis 1. Certainly ancient Near Easterners could believe a high god “rested” in a literal sense not just a purely metaphorical sense of “rest” = nothing but “ruling”–as Walton wishes to portray the “rest” in Genesis 1 and in Exodus (both being in their final forms the product of priests, who were definitely interested in the Israelites literally “resting” on the Sabbath day). Prof. Smith is a premier OT scholar whose work The Priestly Vision of Genesis 1 is quite comprehensive as to its theology and meaning in its first century context. I wrote too hastily, mentioning a Prof. Mark and a Prof. Smith, when I was referring to Prof. Mark Smith, one person. Also, I didn’t mean “first century” [sic]. Thanks for your response Edward. It is true that the word “rest” has other connotations besides “ruling.” Walton’s point (with which I agree) is that the context in Genesis 1-2 suggests the idea of ruling. Before pursuing this further, I would like to acknowledge that you are correct about the actions of the gods in the other ANE accounts you mention. They do create human beings to do their work and to offer sacrifices in order to feed them. As most scholars recognize, however, the Genesis account is a polemic against this sort of characterization. Israel’s God does not need mankind to do His work for Him. Work is for mankind’s own benefit, not for God’s. Furthermore, Genesis, and the rest of the Bible teaches, that God doesn’t need sacrifice, it is mankind that needs sacrifice. Sacrifice is only introduced into the Genesis account after sin enters the picture, not before. Israel’s God is not like the gods of Mesopotamia who gather around the sacrifices of the flood survivor because they are starved. He is completely self-sufficient. These are some of the polemics (the nature of work and sacrifice) that Genesis engages in. 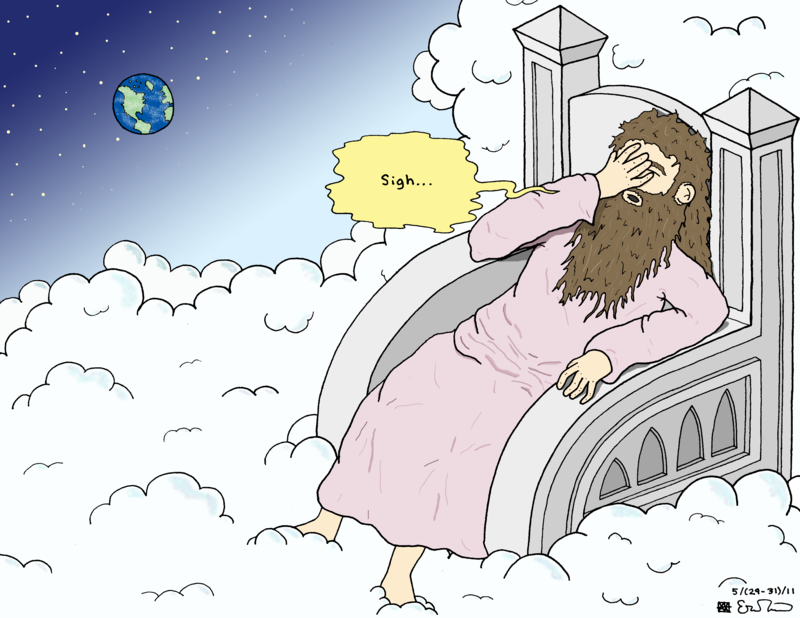 Likewise, the gods of Mesopotamia may grow tired, but no Israelite would take seriously that their God needed a nap. As to your objection that creating the cosmos would involve a lot more work than ruling it, Genesis seems to disagree. The cosmos comes into being in Genesis 1 with no struggle (again, unlike other ANE accounts). The struggle begins when human beings rebel against God and attempt to go their own way. If you’ve ever been a leader over people, you know what hard work being in charge can be! Regarding the word “rest” let me make a few observations.John Oswalt makes the following statement: “Rest involves several components. Fundamental is the idea of a place of repose.” (VanGemeren, W. (Ed.). (1997). New international dictionary of Old Testament theology & exegesis (Vol. 4, p. 1132). Grand Rapids, MI: Zondervan Publishing House). In this article (and I suggest that anyone should read it in its entirety), Oswalt goes on to note the connection between the land promised to Israel and rest (e.g., Jos. 1:13). But for rest to occur, enemies must be driven out, boundaries must be secure (Deut. 12:10; 25:19). In other words, rest involves the ability to rule well. In Genesis 2:1-3 the Creation becomes God’s “place of repose,” (just as a temple is for a god), but true rest only exists when there is good rulership. Just as a king rules from his palace, and a god from their temple, so Israel’s God rules over Creation (His Temple). Your observation about Exodus 31:17 is very interesting. I checked it out and the interpretation you mentioned is certainly plausible. Many modern translations use the term “refresh” as opposed to “fetch one’s breath,” but whichever English translation one uses, your point that the word can be translated this way is valid. I would note, however, that the word “refresh” does not denote taking a nap because one is exhausted. The Israelites were to “rest” and “refresh” themselves on the Sabbath by worshipping and fellowshipping with God. These terms are about relationship as well as a cessation from work. Noted Jewish scholar Nahum Sarna writes the following in his Exodus commentary: “The verbal form used here conveys the notion of a fresh infusion of spiritual and physical vigor, the reinvigoration of the totality of one’s being. Of course, as applied to God, it is an anthropomorphism, the ascription to the Deity of human characteristics. But such language has a didactic purpose: to impress upon the Israelite an awareness of the transcendent value of Sabbath observance” (Sarna, N. M. 1991. Exodus, p. 202). Philadelphia: Jewish Publication Society). It should also be noted that when Genesis 2:1-3 speaks of God resting, the seventh day is never said to end. Therefore, Jews believed that God’s rest has continued ever since. Ps. 95:11 speaks of God’s rest in this way. This passage is picked up by the writer of Hebrews to exhort his readers that God’s people may still enter into His rest. In fact, he also quotes from Genesis 2 as well (Heb. 4:1-10). The term “rest” has connotations of security, peace, fellowship; it is not a term that primarily refers to getting a good night’s sleep. But again, such “rest” (which provides security, peace, etc.) can only exist where there is a good R/ruler. I have studied this topic myself only to discover that some Christian scholars are invoking or emphasizing some false dichotomies when comparing ancient Near Eastern high moral henotheistic gods (like Marduk) and Israel’s high moral god. A high moral henotheistic god who were ruled over all the other gods, was a common ancient Near Eastern trope. Marduk was such a god for the Babylonians. And just like the Israelite high god, the Babylonian high god Marduk created the heavens and the earth and did not need mankind to do his work for him. It was not seriously imagined that Marduk would simply starve to death if humans didn’t perform sacrifices to him. Also, in the case of ancient Near Eastern gods like Marduk and Yahweh we see that animal sacrifices, prayers, praises, priesthoods and temples were de rigeur, in a sense they were demanded if one was to worship a high moral god, a henotheistic, monolatrous or monotheistic god. And the Israelite versions of such things were far from being the earliest. “[The citizens of Babylon] had oppressed the weak, and handed the weak into the power of the strong. Inside the city there was tyranny, receiving of bribes, people plundering each other’s things, sons cursing fathers in the street, slaves cursing masters, they put an end to offerings [to the gods], they laid hands on the property of the temple of the gods, and sold silver, gold and precious stones… Marduk [the high god of Babylon] grew angry and devised evil to overwhelm the land and destroy the peoples,” cf. W. G. Lambert, Babylonian Wisdom Literature (London: Oxford University Press, 1960), p. 5. In fact, the idea that a divine being gave the king of Babylon his laws for the nation preceded the Israelite idea that a divine being gave the Israelites their laws. Even the idea that a divine being dictated how it wanted its temple to be built preceded the Israelite idea that Moses was given the layout of the tabernacle and David or Solomon the layout of the Temple by Yahweh. These were common tropes. True, the Israelite god creates without struggle in Genesis 1, but just as the Egyptians and Mesopotamians told different stories about creation, some with no conflict at all, there is evidence of more than one creation story in the Bible. Mark S. Smith in The Priestly Vision of Genesis 1 points out that the book of Psalms includes some creation hymns that were probably composed earlier than Genesis 1 and adds that those hymns and other creation passages in the Bible may represent some of the earliest beliefs of the Israelites about creation. However, because Genesis 1 was composed with greater sweep, significance, and priestly precision, and placed at the beginning of the Hebrew Scriptures, those other creation passages lost the prominence they once held. In short, the god(s) were perched on a celestial balcony, so to speak, gazing at the drama below, handing out blessings and curses to individuals and nations alike; at least that’s what the people believed who built the temples, founded the priesthoods, invented holy rituals, and performed burnt offerings (so the smoke would ascend to heaven as a “soothing aroma”—see Genesis 8:21; Exodus 29:18, 25; Leviticus 3:16, 6:21 and Numbers 15:3, 10). Moreover, the Israelites shared with their neighbors the eastward orientation of their tabernacle and temple, the placement of important cultic objects within them, the designation of areas of increasing holiness, rules for access to the Holy Place and Holy of Holies, as well as practices like circumcision and sacrificial offerings.58 Like other nations, they feared the anger of their god and subsequent punishment if attention was denied him. The duty of kings and priests was to ensure such attention was maintained, for the safety and security of the nation.